Ms. Christenson spoke first, explaining to the Club how she became aware of the plight of polio victim and her appreciation for Rotary’s eradication efforts. When Ms. Christenson was a child, she had a friend who contracted the disease and remembered receiving the polio vaccine years later. Even later still she visited the Philippines, where she witnessed the ravages of polio and its impact on the human condition. She did not tie devastating effects of the disease to what it actually was until she joined Rotary. She is now a strong advocate of continuing the Rotary's efforts at polio eradication. Ms. Christenson also highlighted the importance of building and maintaining Rotary membership. She challenged each club in the District to add and maintain at least one new member this year. Finally, she encouraged Rotarians to continue to support the Rotary Foundation, the charitable arm of the organization. These funds directly contribute to local service projects. Rotarians next heard from U.S. Senator Jeff Flake. Sen. Flake began his remarks by expressing his appreciation for the Sierra Vista community’s efforts to support the military and the nation's defense. Sen. Flake then described Congress’s efforts at creating this year’s budget. He explained that in the past, once a budget had been passed, each appropriations bill was passed individually, allowing for discussion and deliberation on each aspect of the budget. He lamented that the new practice is that Congress now lumps all appropriations into an omnibus bill, which is presented as a continuing resolution that only allows for temporary funding of federal programs, etc., rather than providing permanent funding for budgeted items. Sen. Flake turned his comments to address what he sees are major issues facing Arizona, including water, forest health and severe environmental regulation. Se. Flake explained that in recent years, water has become a major concern for the state, noting that if the major Colorado River reservoirs drop to a certain pre-determined level, mandatory water restrictions will be imposed that hit Arizona first and hardest. In the past couple of years, Arizona has averted the shortage by some users voluntarily leaving water in the reservoirs. However, water will continue to be an issue. Forest health is another major concern for Arizona, having lost nearly 20% of its ponderosa forest to two major wildfires recently. 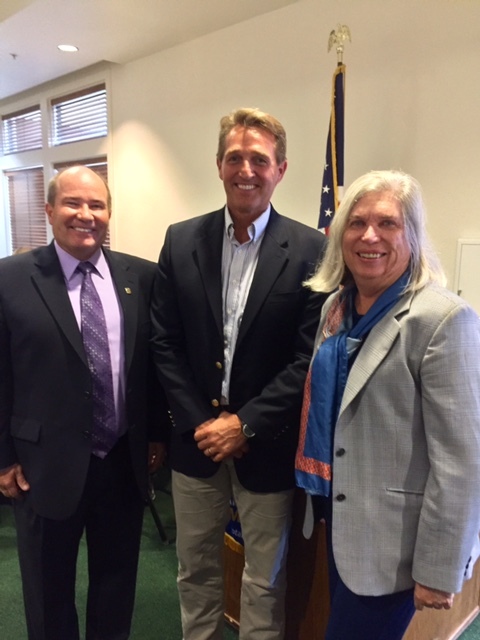 Sen. Flake feels that in order to improve the forest’s health, some federal lands should be allocated to private industry for management, as the Forest Service and BLM do not have sufficient resources to adequately address the issue. Finally, Sen. Flake opined that the current administration's environmental stance with regard to power plant emissions has disproportionately impacted Arizona's ability to compete economically.